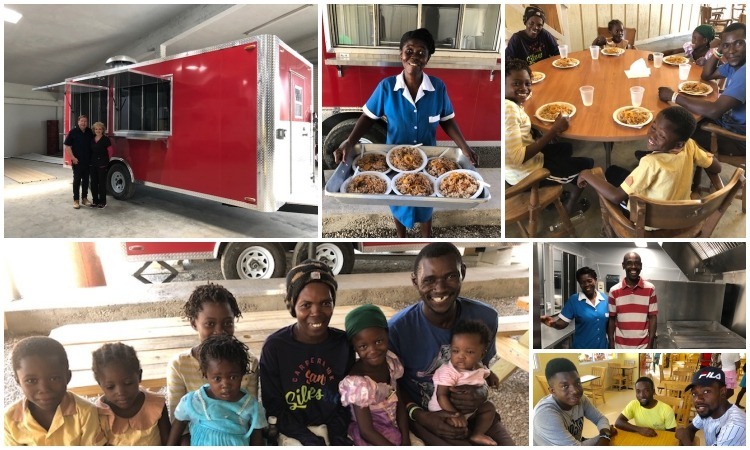 Thank you Richard Hotes of the Hotes Foundation for donating this beautiful 2019 custom made mobile kitchen! It was an answer to our prayers! The first family this week we fed from the mobile kitchen was the little family from the dump. The little children were smiling from ear to ear with their hot plate of food! The mobile kitchen employs four cooks. The lady holding and serving the plates of food is Madamn Vela. Some time ago we moved her and her children from the garbage dump to Miracle Village. Thank you, Richard and your dream team for all your help during the earthquake. Thank you for all your help, for helping build Miracle Village for the earthquake victims. It should have taken 5 years to build, but when your dream team came in, we all did it in one year!! !